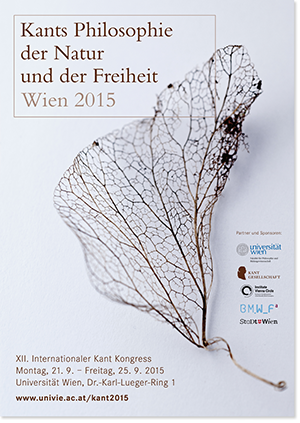 The 12th International Kant Congress in Vienna is dedicated to the antagonism of nature and freedom, which is as much an issue of great relevance in contemporary discussions as it was during the Enlightenment period. The question of to what extent human actions are guided by nature or free will seems even less clear in modern times than it was in the 18th century. Kant’s writings offer significant potential for contemporary interdisciplinary discussions, which connect philosophy with natural sciences, medicine, neurology and psychology, law and social sciences. While the Kant Congress 2015 will mainly focus on these issues, there will be also three key topics related to Vienna: Kant and the Vienna Circle, Kant and phenomenology and Kant and the poets. Furthermore, there will be various additional sections in order to account for the wide range of topics in Kant’s philosophy. Please submit a full paper, consisting of max. 8 pages (= 20.000 characters, spaces included) as well as an abstract consisting of ½ page (= 1.000 characters, spaces included) and identify the section your paper refers to. Presentations should not exceed 25 minutes. Papers must be suitable for anonymous review. Please refrain from making references to your own work or anything obvious that could reveal your identity. Authors will be notified of the review outcome not later than March 1, 2015. Participation in the congress is also possible without a paper.